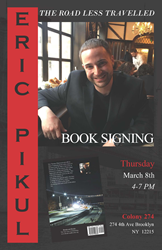 Boulevard Books is proud to announce the book launch of A ROAD LESS TRAVELLED, the widely anticipated volume of poetry by Eric Pikul at COLONY 274 located at 274 4th Ave, Brooklyn NY 12215. "I share each of these poems with you from my heart and from my soul," Eric writes. "Every verse takes on new meaning and delivers a specific message to the reader. Universally relatable, this collection provides both motivation and insight into a wealth of topics we all deal with. Without further a due take this walk with me down A Road Less Traveled." Boulevard Books was founded in 2010 by author and educator Avi Gvili in order to empower authors everywhere with control of their work. It is the only publishing company that offers 100% royalties.